The unique irresistible sound became one of the most significant musical genres of the 20th century. Their music became a beacon of communication that brought a country together. 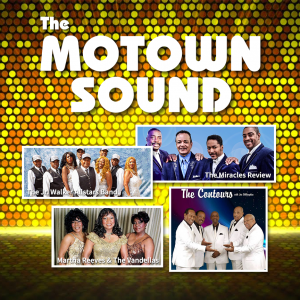 With more than 180 #1 hit songs, which still influence music today, from pop to hip-hop, Motown’s 50 + years of musical history is wrapped up in Motown Legends presented by Titan Productions. Autry DeWalt Mixon Jr. (June 14, 1931 – November 23, 1995), known by the stage name Junior Walker, styled as Jr. Walker, was an American musician. His group, Jr. Walker & the All Stars, were signed to Motown’s Soul label in the 1960s, and became one of the company’s signature acts. Jr. Walker died of cancer at the age of 64, but his legendary sax sound carries on through his band, in this all-star Motown review. Martha and the Vandellas were an American vocal group who found fame in the 1960s with a string of hit singles on Motown‘s Gordy label. Founded in 1957 by friends Annette Beard, Rosalind Ashford and Gloria Williams, the group eventually included Martha Reeves, who moved up in ranks as lead vocalist of the group after Williams’ departure in 1962. The group signed with and eventually recorded all of their singles for Motown’s Gordy imprint. The group’s string of hits included “Come and Get These Memories“, “(Love Is Like a) Heat Wave“, “Quicksand“, “Nowhere to Run“, “Jimmy Mack“, “Bless You” and “Dancing in the Street“, the latter song becoming their signature single. During their nine-year run on the charts from 1963 to 1972, Martha and the Vandellas charted over twenty-six hits and recorded in the styles of doo-wop, R&B, pop, blues, rock and roll and soul. Ten Vandellas songs reached the top ten of the Billboard R&B singles chart, including two R&B number ones, and six Top Ten Pop Hits on the Billboard Hot 100. The Miracles were an American rhythm and blues vocal group that was the first successful recording act for Berry Gordy‘s Motown Records, and one of the most important and influential groups in pop, rock and roll, and R&B music history. Formed in 1955 by Smokey Robinson, Warren “Pete” Moore, and Ronnie White, the group started off as the Five Chimes, changing their name to the Matadors two years later. The group then settled on the Miracles after the inclusion of Claudette Robinson in 1958. Today, the Miracles Review epitomizes the sight, sound and R&B soul of the original group. In the summer of 1962, The Contours hit the jackpot when Berry Gordy penned the classic “Do You Love Me” for them. “Do You Love Me” became the group’s biggest hit as well as Motown’s fastest climbing hit of all time. Within two weeks of release, “Do You Love Me” became the #2 record in the nation as well as the group’s first gold record. The ensuing years brought forth such Contours hits as “Shake Sherrie”, ”Can You Do It”, “Can You Jerk Like Me”, “Just A Little Misunderstanding”, and “First I look At The Purse”. The Contours have proudly worn the label “Motown’s #1 party group” for more than 40 years. Today under the leadership of original member Sylvester Potts, The Contours are center stage once again. A Contours show is jam-packed with dazzling choreography, impeccable harmonies and those timeless Motown grooves that everyone knows and loves.